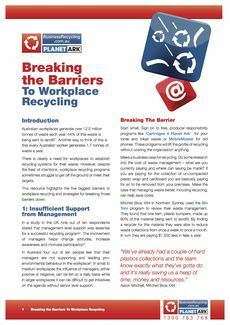 The Breaking the Barriers To Workplace Recycling resource is available as a downloadable pdf, or you can bookmark this page for reference. Australian workplaces generate over 12.5 million tonnes of waste each year. 44% of this waste is being sent to landfill. Another way to think of this is that every Australian worker generates 1.7 tonnes of waste a year. There is clearly a need for workplaces to establish recycling systems for their waste. However, despite the best of intentions, workplace recycling programs sometimes struggle to get off the ground or meet their targets. In Australia four out of ten people feel that their managers are not supporting and leading pro-environmental behaviour in the workplace.2 In small to medium workplaces the influence of managers, either positive or negative, can be felt on a daily basis while in larger workplaces it can be difficult to get initiatives on the agenda without senior level support. Start small. Sign on to free, producer responsibility programs like ‘Cartridges 4 Planet Ark' for your toner and inkjet waste or MobileMuster for old phones. These programs will lift the profile of recycling without costing the organisation anything. Make a business case for recycling. Do some research into the cost of waste management - what are you currently paying and where can saving be made? If you are paying for the collection of un-compacted plastic wrap and cardboard you are basically paying for air to be removed from your premises. Make the case that managing waste better, including recycling, can help save costs. Mitchell Bros 4X4 in Northern Sydney used the Bin Trim program to review their waste management. They found that one item, plastic bumpers, made up 80% of the material being sent to landfill. By finding a recycler for this material they were able to reduce waste collections from once a week to once a month. In turn they are paying $1,500 less in fees a year. "We've already had a couple of hard plastics collections and the team know exactly what they've gotta do and it's really saving us a heap of time, money and resources." - Aaron Mitchell, Mitchell Bros 4X4. "If you make it a policy and educate your staff then eventually these activities will become second nature to everyone. And you might be surprised of what other environmentally sustainable work practices your staff will initiate after." For recycling to become a habit, as it is in most Australian homes, everyone needs to know exactly what to do. Insufficient training results in confusion, which has a number of potential outcomes including active recyclers becoming disheartened and non-recyclers avoiding the program or becoming openly hostile. When establishing a new program ensure that you factor in a staff training element. It should include clear information about what the program aims to achieve, why it's being undertaken and, most important of all, exactly what is expected of each staff member. Training is an essential part of any recycling program, so make sure you include it in the early planning stages. If you are using an external contractor, ask if they have training resources you can use or whether they can facilitate the training as part of their service. Build in training strategies for new staff as they join the organisation. Including recycling in induction sessions, information packs or mentor programs are positive ways to ensure new staff are clear about their responsibilities. Refoil, a small business manufacturer and supplier of recycled aluminium foil to hair salons uses posters, stickers and brochures to educate salon staff on how to recycle foil correctly. The costs of waste management are often hidden and most staff don’t have any direct investment in reducing those costs. When a new recycling program is rolled out employees may simply be told to recycle, without an understanding of the benefits to the environment or to the business. This can encourage staff to look at the new program as an imposition and to feel disengaged from it.11 They are especially likely to react against a program if it involves changes to their usual activities. It’s important that staff understand both how and why they are being asked to recycle. Providing this information has been shown to motivate employees and increase participation.10,11 Additionally, providing feedback on achievements and successes further reinforces the positive behaviour and makes recycling a feel good activity. Provide specific feedback including total amounts recycled and cost savings and make feedback sessions a part of regular communications. This might mean providing information or feedback as part of regular staff meetings or electronic communications like newsletters or the intranet. Following the implementation of recycling services across four sites Hepburn Health Service in Victoria developed a communications plan to ensure full staff participation. An Environmental Management Committee was established with representatives from all four sites who developed regular newsletters, educational emails and other resources that were sent to all staff. These communications included instructions on the systems as well as positive feedback. "...small changes in behaviour can have large impacts in reducing waste." Place the ‘Cartridges 4 Planet Ark' box and the paper recycling bin next to the printer or photocopier. On-desk paper trays or under desk bins are also a great way to capture paper for recycling. Some materials need to be separated at their source for the best recycling outcomes. Material like oils or chemicals become contaminated when mixed together, which prevents them being recycled. For these materials set up collection stations that are easily accessed at the point of collection and are clearly marked. Make it noticeable - Use eye catching images and colours and once it's been on display for a while move it around to prevent sign-blindness. Make it self-explanatory - Telling people exactly what's required of them will be more effective than being smart, bossy or funny. Put it as close to the action as possible - Put the signage on or above the recycling bin. Make it positive - Being told not to do something can make people feel resentful. Wherever possible, frame signs in the positive and thank people for participating. When DB Schenker Global Freight Forwarders, introduced mobile phone and battery recycling they used the BusinessRecycling website to find clear and easy to understand signage. "I was able to find a variety of resources and posters on the site. It was clear for our staff to see the new recycling initiative and see how to use it." Make recycling at work easy! The BusinessRecycling.com.au website and hotline (1300 763 768) have reuse and recycling options listed for around 90 different materials. The site also has resources to help you choose the right recycler, free signage and case studies showing how others manage their waste and recycling programs. practical information to help you waste less and save more. View the list of references used for Breaking the Barriers To Workplace Recycling.